CardMunch by LinkedIn tries to bridge the old school business card and a handshake way of business with the LinkedIn and CRM-addicted modern mode of business. 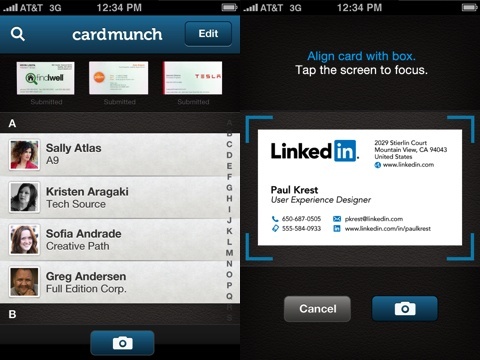 Graphically, the CardMunch iPhone has the similar branding and hallmarks of LinkedIn’s iOS app with its black screen and bright blue pop-ups for navigation. The tools can, however, be a bit confusing and unsuccessful. 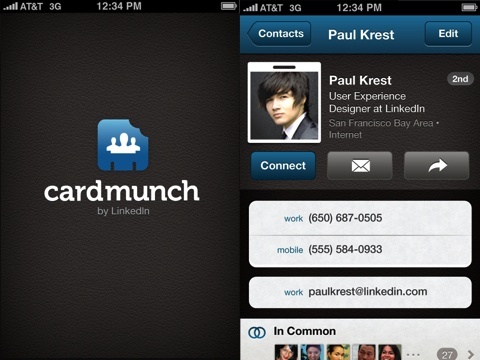 You get started with the CardMunch iPhone app by signing into your LinkedIn account. The screen to take photos of business cards is simple. There are guides to help you properly position the business card. You can tap the screen to adjust the focus. You touch the camera icon to take the shot. The photo is quickly processed, and you can retake or upload it. Your cards are transcribed by CardMunch’s team. If you have enabled push notifications, you are notified when the transcription process has been completed. When I snapped photos and submitted them for transcription, I found the process to be quick and surprisingly accurate. I did not discover a discrepancy. If it is not accurate, you can resubmit the card to the CardMunch iPhone app team with two simple touches on the screen. At first glance, the contact interface in the CardMunch iPhone app seems nicely organized with a photo of the business card at the top of the screen and the contact’s standard information (phone numbers, snail mail addresses, email addresses, fax numbers, IM) under the photo. When you dig into the functionality and tools, the CardMunch iPhone app is confusing. There are three icons that allow you to use the information gleaned from the business card–“connect,” email envelope, and an arrow. The connect button sends a direct message to connect through LinkedIn’s online and mobile applications. The email envelope allows you to send a direct email message to a contact’s email with friendly, professional canned lingo that LinkedIn has perfected, as well as a link to your LinkedIn profile. The arrow icon allows you to forward the contact’s information from your email address, remove the contact from your iPhone, resubmit for better transcription, or delete the contact. It’s confusing to know when you’re in the LinkedIn world and when you’re in your email world. And, there’s no way to add the contact to your iPhone contact list from the CardMunch iPhone app. If you want to add it, touch the arrow and forward yourself the .vcf file. You can then sync it with your contacts or CRM software. In one significant way, the CardMunch iPhone app streamlines the process of keeping up with your business contacts, but the lack of intuitive functionality for sharing and scoring a deal undermines the successful transcription process. The CardMunch iPhone app reminds me of Facebook’s Camera iPhone app. They intend to enhance their powerful social networks with branded iOS apps, but, instead, you’re disappointed that a great tool is not fully realized. AppSafari review of CardMunch – Business Card Reader by LinkedIn was written by Jenni Ward on July 23rd, 2012 and categorized under App Store, Contacts, Enterprise, Free, Productivity. Page viewed 4760 times, 1 so far today. Need help on using these apps? Please read the Help Page.